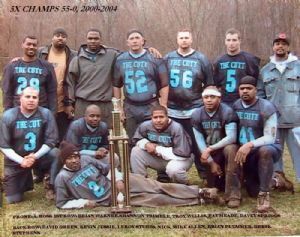 This photograph depicts "The Cutt" Cumberland Flag-Football League Championship Team. This team compiled a record of 55 wins and zero losses while on their way to winning five consecutive league championships from 2000-2004. The team is sponsored by Derik Stephens, owner of "The Cutt Barber-Stylist Shop" on Pine Avenue. Reclining in the first row is Anthony Ross. Kneeling behind Anthony, from left to right, are Brian Warner, Shannon Trimble, Troy Willis, Pat Meade, and Davey Spriggs. In the back row, left to right, are David Green, Kevin Jessie, Leroy Stubbs, Nick Allen, Mike Allen, Brian Plummer, and Derik Stephens, the team sponsor.